Another Merry Christmas to Me! 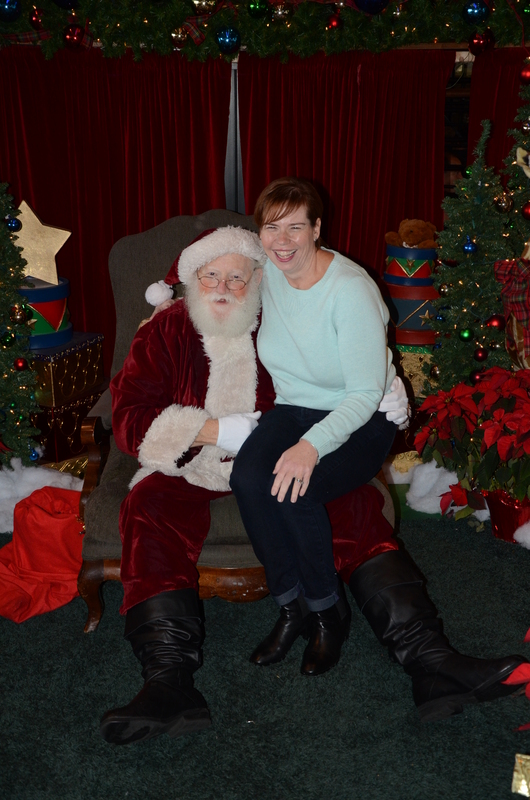 Another Christmas and another year of me sitting on Santa’s lap! Being 105 pounds lighter makes sitting on his lap much easier…for both of us! Yes, another Christmas is here during my year and a half weight loss journey! It’s hard to believe it’s been this long since I had my gastric sleeve surgery and three months since I had my hernia repair and tummy tuck surgery. December is always a busy month with activities and of course, food. It’s a good time for me to reflect on the presents I have received this year. The best present I gave myself this year is maintaining my 105 pound weight loss. Some days I’m down more weight and some days I am up, but I stay in my “weight window” so I’m happy. I love holiday food, especially anything with peppermint, and I’m not going to give that up. Santa wouldn’t want me to, would he? What I do is moderate my peppermint intake. A tall skinny peppermint mocha is just as satisfying as a grande. Christmas cookies are lovely, but one is just as good as three, which is what I would have done in the past. And to help with the increased eating of the season, I am keeping up my physical activity. Adding more walking into my day-to-day routine is so simple and so effective. Running is keeping me healthy both physically and mentally during the craziness of the holiday. My Christmas present to myself was new running shoes. To keep motivated, I signed up for my next race in January with my son. The fact I can run and now share this experience with my children is better than any beautifully wrapped gift from a store. Christmas is just one day of the year and so much pressure is put on us to have an over the top day. I’m working on making it an enjoyable and loving day with my family and not trying to keep up with an over-idealized, pressure-filled day. My weight loss journey should be the same, I think. There is pressure to hit a certain number, whether it’s a number on the scale or a clothing size. In reality, my weight loss journey is about living a healthy, positive life. Being healthy physically and mentally is a gift I need to give myself all year long. I’m looking forward to re-gifting this every day! Here I am in 2012, 2013 and 2014 at the races! I love seeing how happy I am every year after the race. And I’m happier that I look and feel healthier every year! Last Thursday I ran my third Thanksgiving Day race. While my speed improves each year, I am most proud of my increased confidence in setting and reaching goals. Running is more than just exercise; it keeps me focused and motivated to keep living a healthy life. While I knew running would help in my gastric sleeve journey, I didn’t expect the many positive results it would bring. My last two races were 5K races on city streets. My friend, N., and I decided to switch to another race in our neighborhood. It seemed like a great idea until I received the first email from the organizers. That’s when I noticed that it was a five-mile race not a 5K (3.1 mile) race. In the words of Scooby Doo, “ruh roh!” Not only was this race an extra two miles, but the course wasn’t on roads, but mostly through grass fields and woods. N. and I decided to do it anyway. What could go wrong? My head told me there were many things that could go wrong! The race was only nine weeks after my abdominal hernia and tummy tuck surgeries. My incision was healing slowly and my abdominal muscles were sore and strained from time to time. I only started running four weeks before the race so I didn’t have much training or miles under my belt. I had every reason to back out of the race or at the very least change it back to the 5K race. Believe me, I thought about it often in those weeks preceding Thanksgiving. What kept me committed to the new race was one thought: all I have to do is finish. That simple phrase kept me training and made me show up on Thanksgiving morning with my turkey headband and running shoes on. Here I am getting ready for the Thanksgiving 5-Mile Race! I love that running on Thanksgiving has become a tradition. All I really needed to do was finish the race to feel successful. I’m not a competitive runner…with anyone but myself. I only need to be competitive with myself. I ran two earlier races with hindering factors and I finished. If I could do the first race 100+ pounds heavier and finish I could do this new one. And last year, I ran four and a half minutes faster than the previous year with my abdominal hernia still intact and I finished. I could do this even if it meant I was the last person over the finish line. But I wasn’t the last over the finish line! I finished with my best running pace ever. But more importantly I loved the race. There is an amazing energy on the starting line of a race, especially one with people dressed as turkeys and pilgrims! I lined up with the other runners and followed the lead runner dressed as a turkey though the course. I managed to actually run the first two miles which surprised me. I am more of a walker/runner but the excitement kept me running. Throughout the race I ran when I could and walked when I needed. I finally realized there is no shame in walking. Many people were doing the same. Again, I kept in mind that I just needed to finish. When I came to the three-mile mark, I had to make a choice. There was in fact a three-mile walk I could do or keep going to the five-mile finish. I came up on the literal fork in the road and chose the five-mile. I really wanted to finish five miles I decided. At that moment I realized I could do it! I made it to the five-mile finish line with a smile on my face! Nothing feels better than accomplishing a goal that you set. Even though I had doubts up until race day and even in the beginning of the race, I kept going. Running is the perfect metaphor for my weight loss journey: do your best at your own pace and you can work through your doubts and fears. I never thought something as simple as running would give me such hope, joy, and confidence.